The Global G-48 18cm Fluted Santoku Slicer Chefs Knife is an all-purpose Santoku with eye-catching designs and features. It’s forged with one piece of molybdenum/vanadium stainless steel, creating a sharp blade that’s resistant to stain and rust. Global did away with bolsters for this knife, instead using the same high-tech molybdenum/vanadium stainless steel to create the entire handle. In fact, this handle is hollow, but it is filled with a precise amount of sand. This sand creates a perfectly weighted handle that offers balance throughout the entire cutting motion. The moulded handle is dimpled, for a comfortable and secure grip. Another unique aspect of this blade, due to not having any bolster, is a longer cutting edge and a bigger sweet spot. This allows for full edge use and sharpening of the entire blade. It is a very thin, sharp blade, typical of a Santoku. This high-tech Global G-48 18cm Fluted Santoku Slicer Chefs Knife performs very well at thin slicing and dicing thanks to it’s acutely sharpened edge. It’s lightweight and easy to use. How many knives do you need in your kitchen? According to Chef Ludo Lefebvre in this great little video, you only need 4! The high-tech stainless steel used is not only sharp and holds its edge well, but it is durable too. It’s stain and rust resistant, although like all high-quality knives, is not meant for the dishwasher. The problem with having a favourite knife, is that you tend to use it a lot, which is great, until the blade gets dull. Then you need to sharpen it to bring it back to its best. Chef Ludo Lefebvre makes me laugh and he is here with ‘Mr Global’ to show us all how. The moulded handle is very sleek in design, yet it performs very well too. It’s filled with just enough sand to balance the blade and feel comfortable in hand. The dimples offer extra grip compared to some of the typical laminated handles seen on other chef knives. It’s one of the lightest chef knives of its size. This is partly due to design, and partly due to the materials used. Fatigue won’t be much of a factor with this knife as this is one of the most agile Japanese chef knives available. This is a thin blade that is not necessarily designed for heavy duty chopping. While the G48 can hold it’s own for most tasks, it’s best used for thin slicing and when precision is needed. The molybdenum/vanadium stainless steel lacks the top end sharpness of other metals, like VG 10. The blade does hold an edge well but does not have the same maximum sharpness of other chef knives. The blade of the Global G-48 18cm Fluted Santoku Slicer Chefs Knife is crafted from one piece of high tech, lightweight stainless steel. For maximum balance and weight distribution, Global did away with a bolster and instead used a hollow handle. A precise amount of sand inside of the hollow handle gives this blade ample weight and balance at all times. 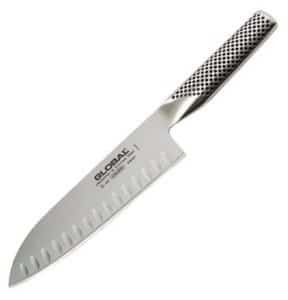 Global G-48 18cm Fluted Santoku Slicer Chefs Knife – The Global G-48 is correctly priced, right in the mid range. It does a few things very well – it’s ideal for thin, precise slices. It’s not the greatest all around japanese chefs knife, but it’s an acceptable investment for most chefs and deserves a spot on the best japanese chef knives list.